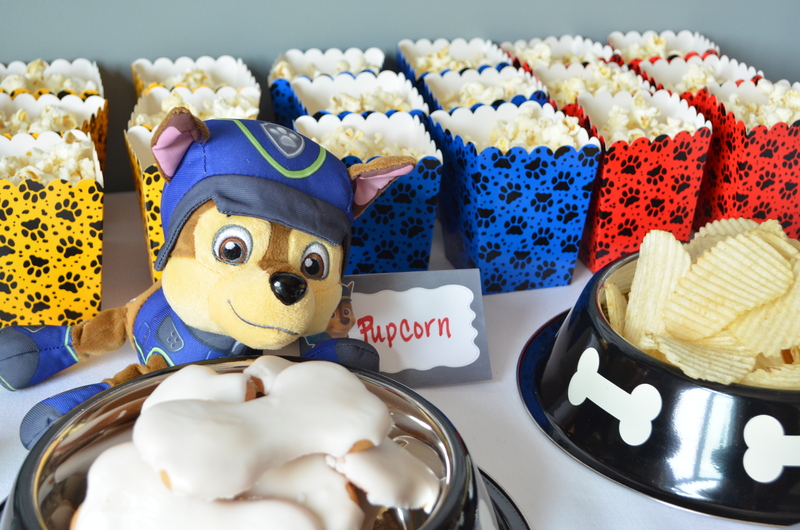 I never expected to get so into prepping for a PAW PATROL theme, but this was such a fun party to get ready for. Etsy helped to save the day, you can find so many puppy/PAW PATROL themed birthday decorations on there. 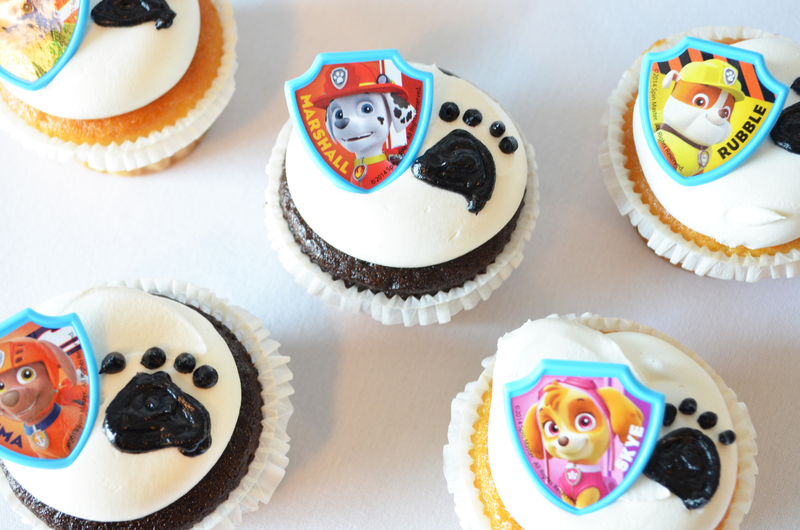 In this post I will share links to all the adorable ideas for Maxwell’s Paw Patrol themed 4th birthday party. These adorable individual PUPCORN boxes I purchased on Oriental trading.com. I’m in love with serving fresh air popped pop corn at kids parties since it’s delicious and very allergen friendly. My go to topping would be butter and salt, but you can customize topping to your liking; for example cinnamon and sugar is a delicious sweet treat. 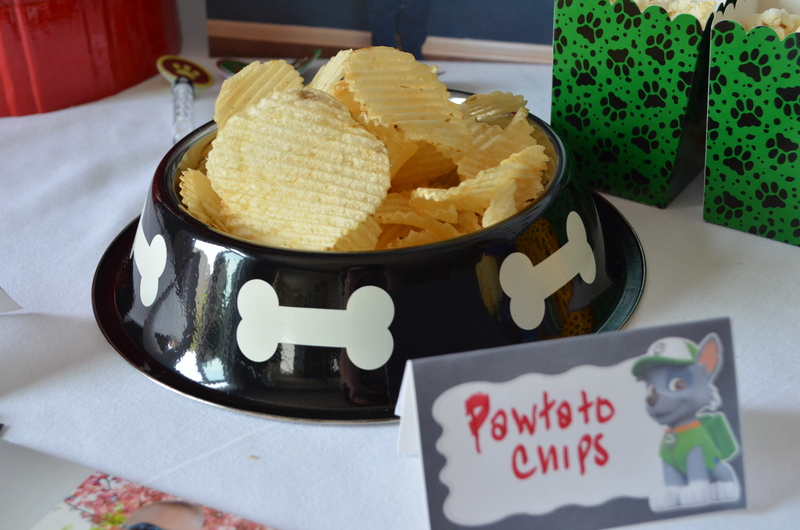 PAWTATO CHIPS served in dog bowls made this table just PAWFECT haha. Can you tell just how invested I had become to this theme? I purchased two different sized dog bowls for the party, using the 32 ounce bowls for the chips and cookies. Dog bone bowls available on Jet.com. Every party I also seem to order these amazingly addictive and delicious short bread cookies from Whole Foods Market. They literally melt in your mouth and to customize the cookie for each party I simply bring my own cookie cutter to the bakery when placing my order. 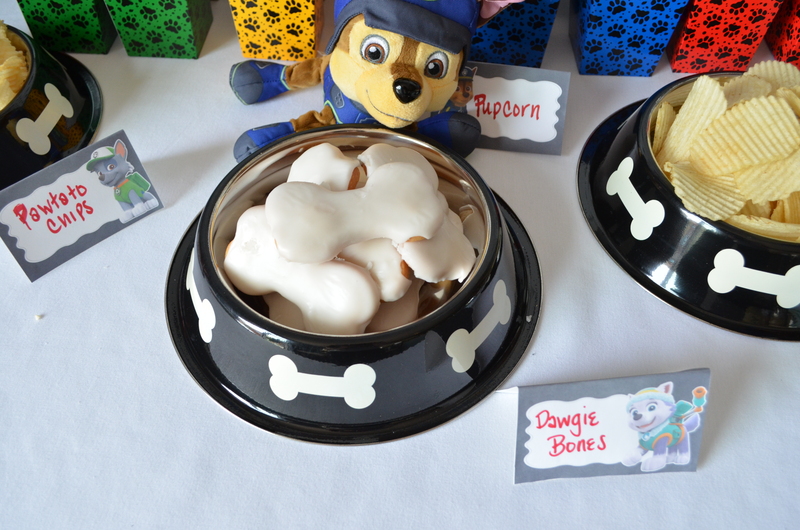 I think every PAW PATROL party Should have DAWGIE BONES don’t you!? Glass container is from the amazing TARGET(did you pronounce that the fancy way?) and filled with fruit jellies from the also amazing Trader Joe’s. 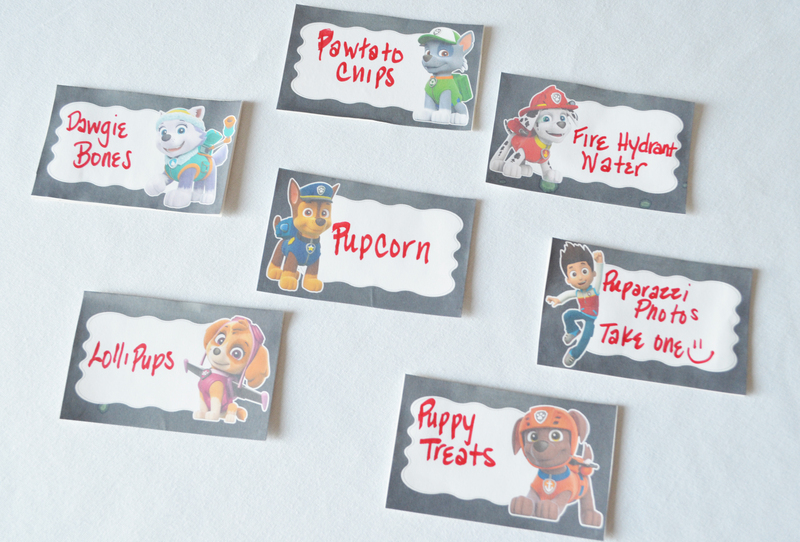 Labeling the candy Puppy Treats was the perfect addition to our Paw Patrol fun filled theme. 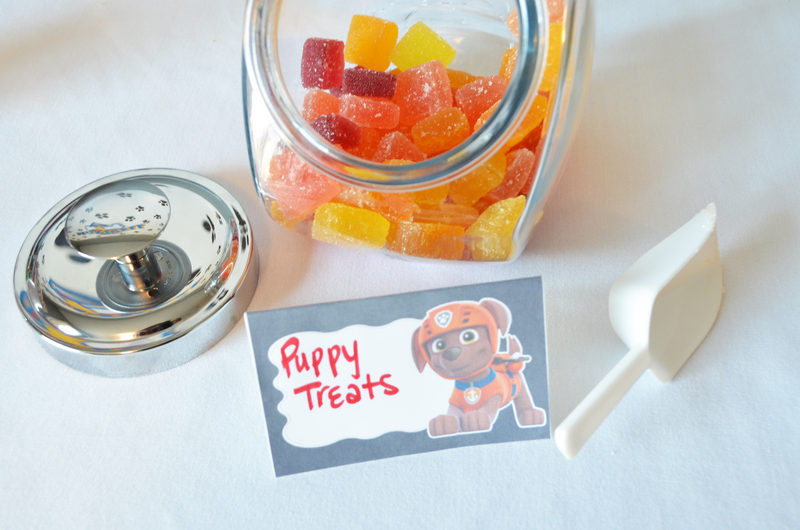 Along side the PUPPY TREATS we had our LOLLIPUPS, also in a larger glass container from Target. A couple days before his PAWTY we decided to have a photo shoot again this year. 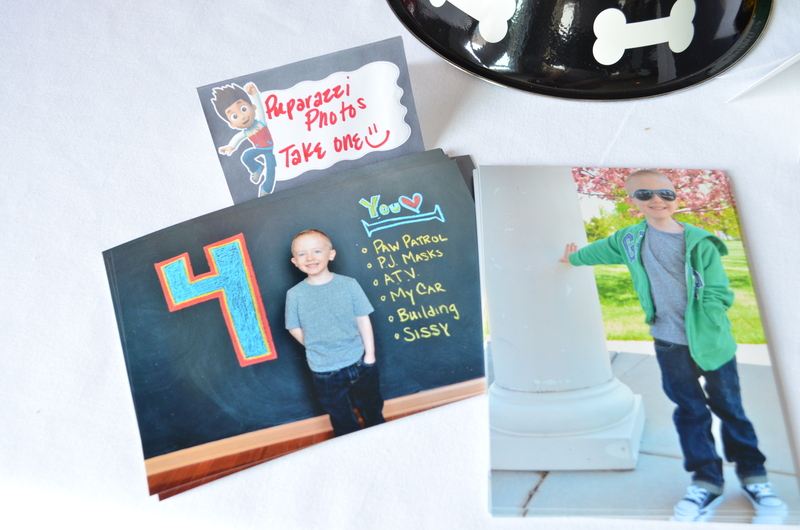 First we started taking photos at our very own chalkboard wall, a tradition we started when Maxwell was 2 years old. Tips for your DIY Chalkboard Wall click here. Then off to a nearby park to take advantage of the beautiful weather we were having. Placing the photo onto the table just wasn’t enough, I needed to think of a label. PUPARAZZI PHOTOS, ha….. I love it! 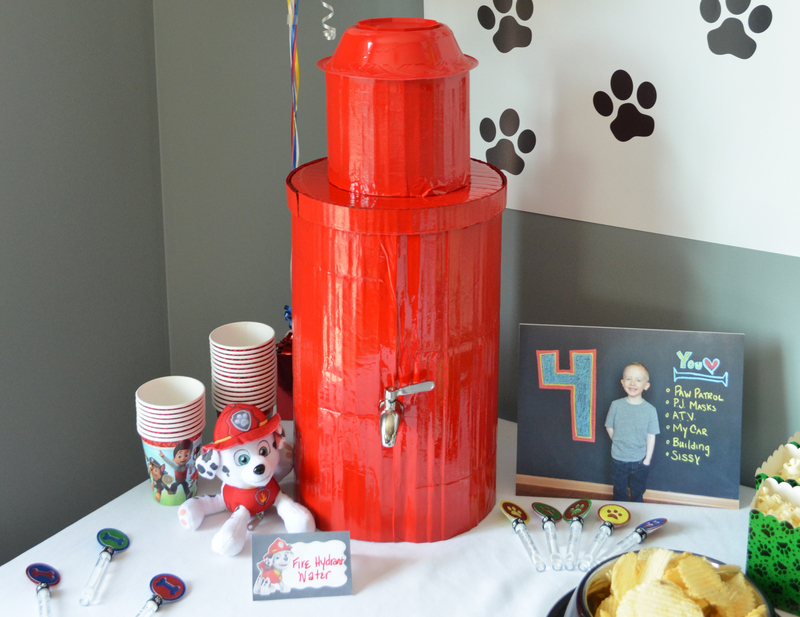 Inside this fire hydrant is our large glass drink dispenser, and we ran out of time to finish this project(missing the sides to the fire hydrant), but still turned out adorable. Highly recommending you take the time to make this project with some cardboard and spray paint so that all your guest can enjoy some delicious and cold FIRE HYDRANT WATER. Placed out on the main PAW Table were these cute little PAW themed bubbles that were found on ETSY. Dog bone crayons were purchased on ETSY via IMAGE OAK, I placed the crayons in the smaller 16 ounce dog bowl purchased on JET.COM. I did add some pales from the dollar section at Target with markers along side just for added fun, but the kids loved the dog crayons by far. 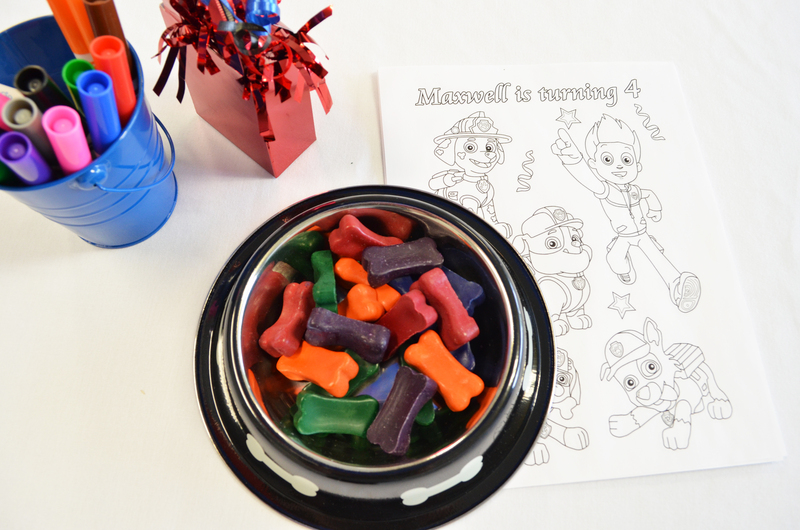 Then of course you need these customized PAW PATROL coloring pages that were found on ETSY via VS STUDIO. 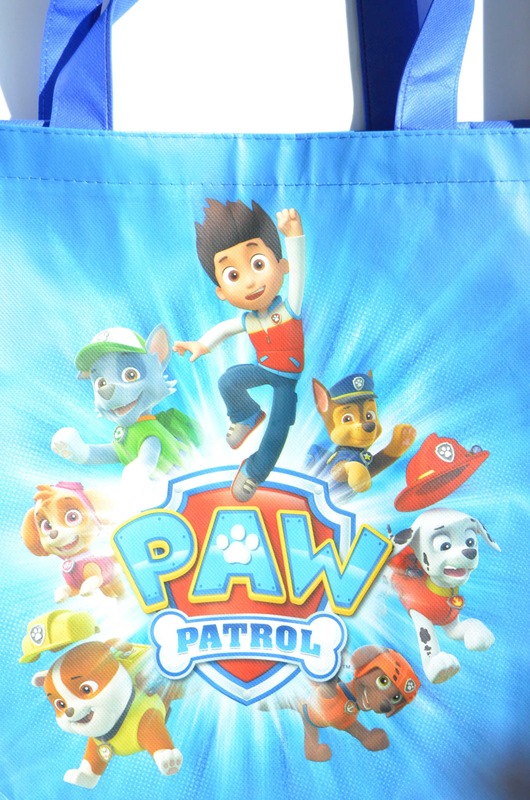 I love PAW PATROL for how it teaches little ones to help out in their community. 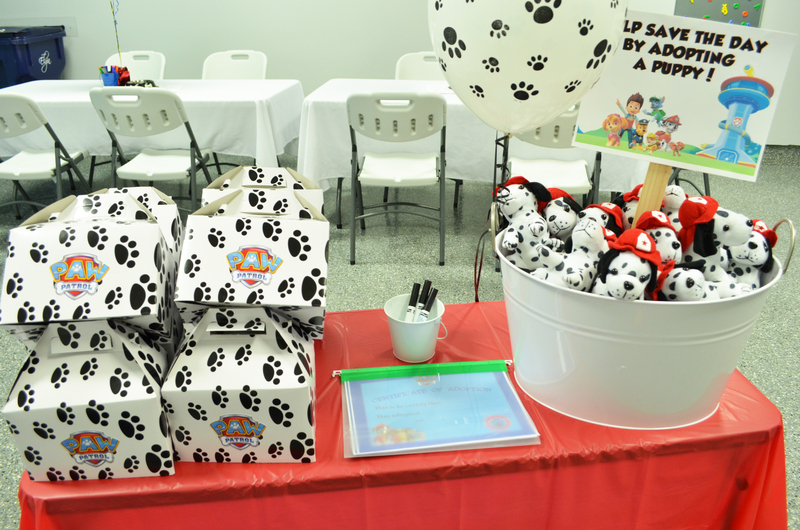 What better way to extend that theme than with a PAW PATROL PUPPY ADOPTION. Click on links below for everything pictured here and you to can HELP SAVE THE DAY BY ADOPTING A PUPPY at your PAWTY! I printed the adoption sign and used a glue stick, adhering it to card stock(or cardboard if you like) then using tape to secure the sign to a paint stick and Voa La. Then placing the sign right into the puppy pail filled with puppies waiting for their adoption. The puppy pail was a ice bucket purchased from Target. The day turned out to be gorgeous, which came as a surprise since we’ve been having such finicky weather in the mid west this Spring. Since the weather permitted we placed our Gazillion Bubble machine from Toys R Us outside, the kids just ran and jumped at the bubbles having lots of fun. 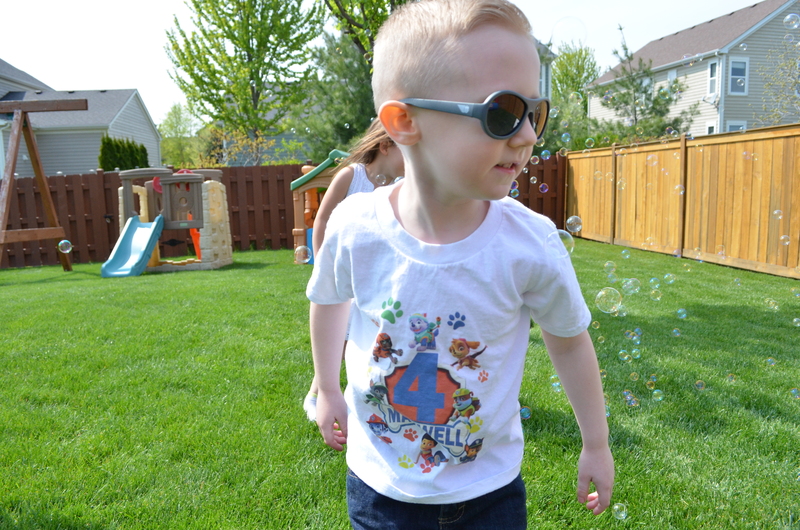 What kind of PAW PATROL PAWTY would it be if the Birthday Boy didn’t have his own personalized Paw Patrol Birthday T-shirt! The Etsy shop I purchased this shirt from sent it promptly and fit true to size, I’m very pleased with my purchase and Maxwell was so happy too. The Pinata was a huge success as I assumed it would be. At children’s parties I’m always trying to be mindful of allergies and not sending the kids home with anything artificial or too sugary. 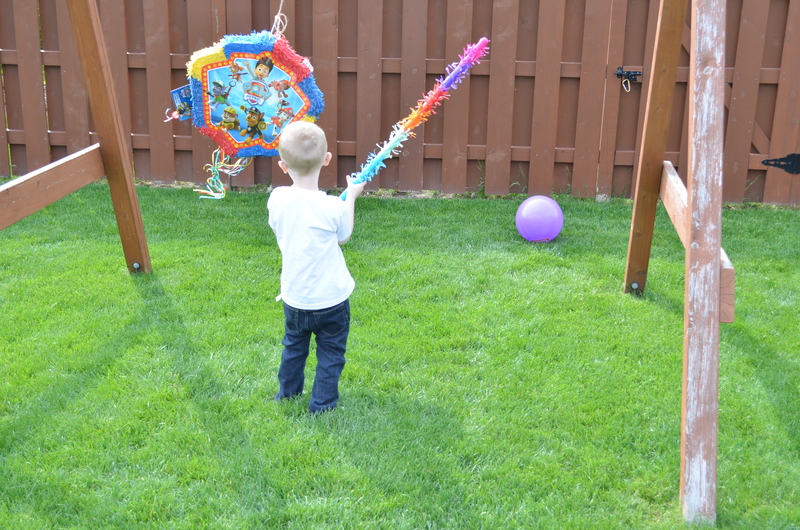 So this pinata came with a package of PAW PATROL filled toys and we planned on adding Annie’s fruit snacks and Trader Joe’s lollipops, but only the lollipops made it into the pinata due to forgetting to pick up the fruit snacks in time. The kids actually enjoyed all the little toys and suckers inside, they used PAW PATROL bags I found at the Target dollar section to gather their prizes. My next favorite thing to share with you is these PUPTASTIC cupcakes purchased from Whole Foods Bakery. 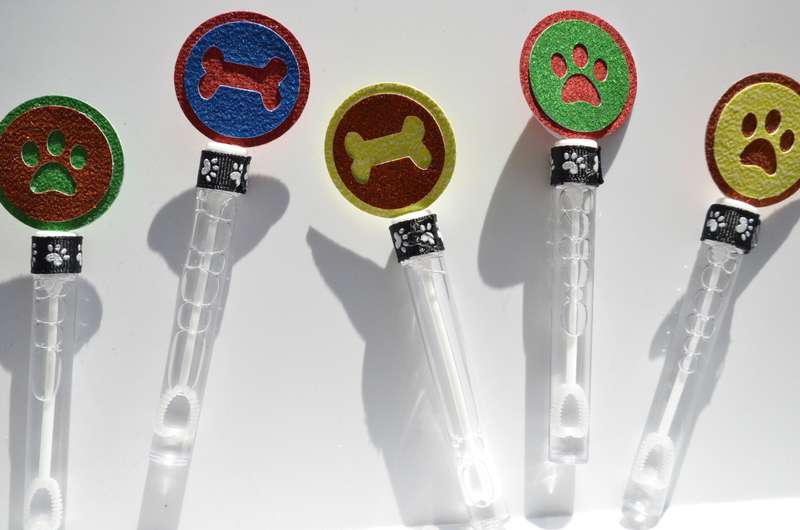 The bakery did everything except for the PAW BADGE RING TOPPER which was purchased on ETSY via THE BALLOON BOX. The ETSY shop is taking a break till July so I searched and found the Paw Patrol Ruff Rescue Cupcake Rings (12 Count) on Amazon.com as well, thank gosh for Amazon always having everything, right?! BONUS: Whole foods bakery uses all natural dyes that are all plant based and they never artificial ingredients BUT, don’t let that fool you, these cupcakes are so darn good! 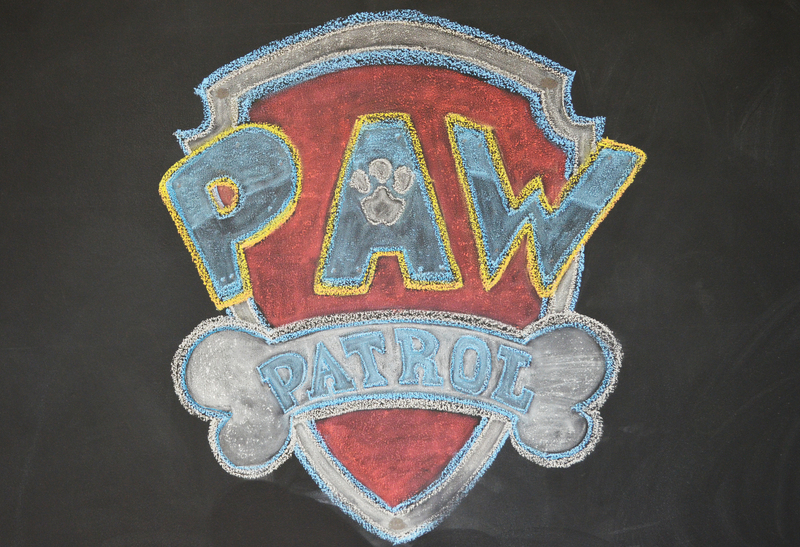 Last but not least the PAW PATROL BADGE drawn on our Chalkboard wall the night before the party. The kids had fun taking photo’s in front of it and was just a cool decoration to such a fabulous PAW PATROL 4th BRTHDAY PAWTY!! !